This was the case in Saturday night’s Ireland’s Lotto Plus 1 draw where the top prize was £4.5 million. When the number balls were drawn, viewers were stunned when they saw two different numbers in one ball. One of the numbers drawn, which lotto officials are saying is the number 38, also had the number 33 on it. The response from the playing public was immediate with some saying that a fix in the draw has been uncovered. 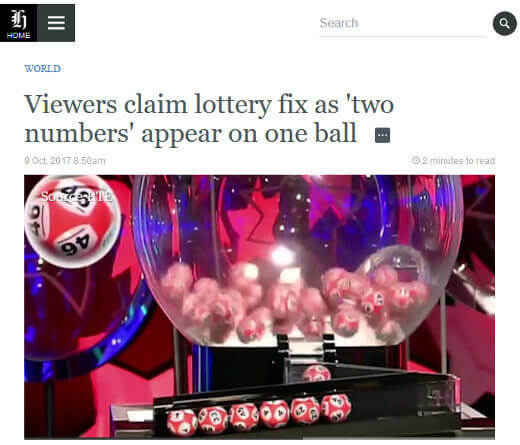 Lottery officials were quick to dismiss the claim as a “brief reflection of light” which seemed to show the number 33 in the middle of ball number 38. Stills taken from the live coverage seem to side with the complaining lottery players. However, lottery officials pointed out that each of the balls are carefully checked before each draw and that the results are audited by no less than independent auditors from KPMG.